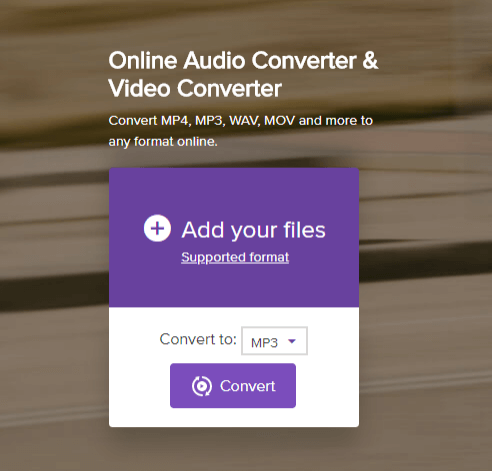 Convert MP4 to MOV, MKV, FLV, MP3, WAV, WMA easily and other 150+ video & audio formats. How to open MP4 in iMovie? As a quite hot file extension, MP4 is widely used for saving media data and can be found in lots of places online or offline, which means, you may download MP4 videos from video sharing sites such as YouTube and Fox, or shared some MP4 videos from others. But the problem with MP4 is, when you plan to edit the MP4 file with iMovie, you may be able to do this, but may be unable to. So what's the matter? Well, this depends. Some hybrid camcorders can capture video footage in both the MPEG-2 and MPEG-4 formats. If your camcorder has captured video footage in both formats, iMovie may only recognize the MPEG-2 movies when accessing the footage from the Camera Import window. MPEG-4 movies recorded with these devices may not be shown. Don't worry. This page will help you successfully import MP4 to iMovie with simple steps. Convert MP4 to iMovie or various formats that supported by different editor, like Final Cut Pro, QuickTime, Windows Movie Makers, etc. 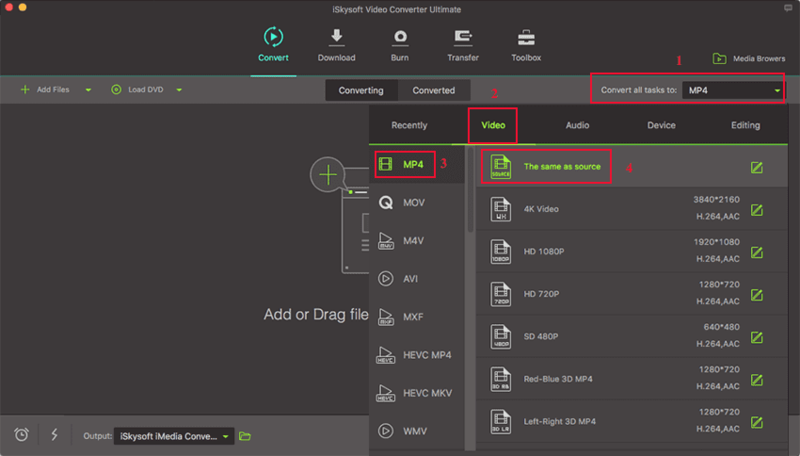 Support Lossless Conversion from MP4 to 150+ HD and standard video formats, such as MOV, FLV, AVI, MKV, M4V, etc. Enhance output performance of your MP4 video before conversion with builtin Trim, Crop, Rotate, Effects, Watermark, Subtitles and others. 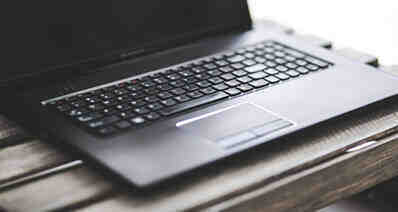 Burn MP4 videos to DVD or copy DVD to various disks for backup whenever you want. Download videos from online websites, including YouTube, Facebook, Vimeo, Vevo, Dailymotion, AOL, Metacafe, Break, and other 1,000 more. Here you can directly drag & drop the MP4 files to the converter, or use "Add Files" to load the MP4 video files. This MP4 to iMovie converter also allows you to directly import from mobile devices, for this, just click the drop down icon beside. You can directly choose the preset for iMovie which has been supplied by the MP4 to iMovie Converter Mac. Select "iMovie" format from Editing tab. The setting also works for iMovie 8, iMovie 9, iMovie 11, and iMovie HD etc. Moreover, the Mac program has some simple edit functions like cropping, splitting, adding effects etc. 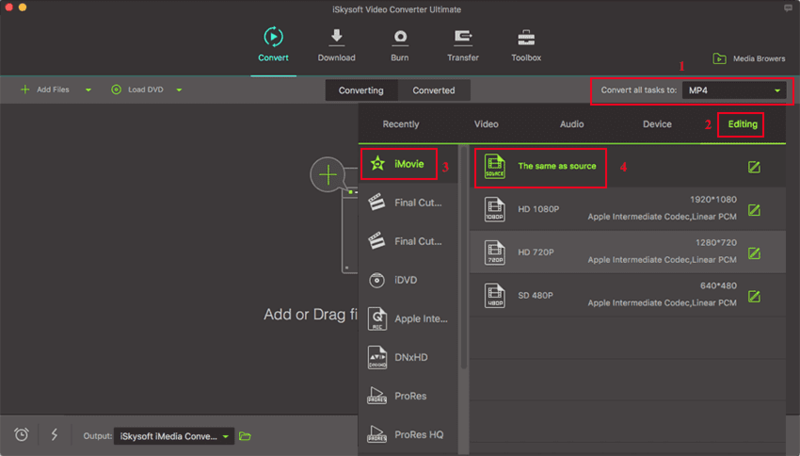 Learn details in the Guide of Video Converter Ultimate for Mac. Windows users could swift to Video tab and choose MOV format instead. Now click the "Convert" button or "Convert All" button at bottom right, and then leave the MP4 to iMovie Converter to do the rest automatically for you. The converter works on MacBook, MacBook Pro, MacBook Air, iMac powered by Mojave, High Sierra, Sierra, El Capitan, Yosemite, Mavericks, Mountain Lion or Lion, and Windows 10/8/7/XP/Vista. 1. In iMovie, Choose "File" > "Import" > "Movies"
If you have some old iMovie projects, and want to involve the converted files into it, just go to "project library" and find your target one, and then also follow the two steps. If you are about to add photos to your project, click the button on the right of the interface and find your photos in iPhoto. Failed to save iMovie as MP4? Take it easy. iSkysoft iMovie to MP4 Video Converter must be the best solution for you to convert iMovie to MP4. Before converting videos, you are able to edit them, such as add subtitles or watermarks, crop or trim video, and so on. If necessary, you can freely change the parameter settings of the output video as you need. If you are looking for solution for 'iMove export MP4', just read the following guides. Here shows you the best way to convert iMovie to MP4 step by step. But first of all, please download the iMovie converter on your computer to proceed (Click the Free Download button below). Now let's begin! Launch iSkysoft Video Converter Ultimate. Add the iMove video that you want to export to MP4 to it by dragging the file. Or click the Add Files option to load the video from your computer. Now simply set the output format. Choose Video and find MP4 option. Select a resolution that you want, including the same as source, 4K, HD, SD, etc. Click the Convert or Convert All if you have added more than 1 videos at one time. It will take seconds to help you convert iMovie to MP4! That's it!